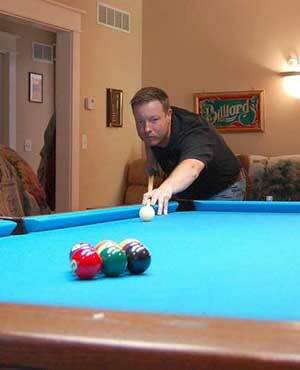 Anthony Beeler is an instructional columnist for Pool and Billiard Magazine and On the Break News. He is the owner and founder of Virtual Billiard Academy and the Angles as a Second Language Course. He is a player representative for McDermott Custom Cues and is a four time Kentucky State 9-Ball Champion. In addition, he also won the 2013 BCAPL National 9-Ball Championship and has a total of six top 25 national finishes to his credit. Beeler finished the Bluegrass BCAPL 2013-14 and 2014-15 seasons as the number 1 ranked player in Kentucky, and is also known for establishing the record for most amateur pool tournament victories in one year (62), which was set in 1999. He is a certified instructor for the American CueSports Association (ACS) and is the primary author of the ACS National Billiard Instructor’s Manual. Recently, he released a new book entitled, Unstoppable! Positive Thinking for Pool Players. Anthony is also a fully licensed Kentucky teacher with a master’s degree in Education Leadership. He has worked in public education for fifteen years. During that time, he worked as a school district administrator for nine years and as a Virtual Learning Consultant for the Kentucky Department of Education for one year. Throughout his pool-playing career, Anthony has won over three-hundred pool tournaments and cashed in several professional events. He is an advocate of long-term instruction and with his Virtual Billiard Academy program you can get 3 months of online instruction for roughly the same cost most instructors would charge for one day of face-to-face instruction. If you have a question about your game or if you want to move your game to the next level feel free to visit www.poolteacher.com or send an email to poolteacher@ymail.com.